Towards the end of last week, Serbia was once again the primary focus of media across the world. After a decade of searching, Ratko Mladić, number one on The Hague Tribunal’s most wanted list, was arrested in the village of Lazarevo, not far from Belgrade. He was hiding at his cousin’s home, he did not try to resist the authorities, and he confirmed his real identity. Last Thursday, slightly before noon, all the networks broadcast the news about the arrest of a certain Komadić who was suspected to be Ratko Mladić. It isn’t the first time that the networks make such an announcement. B92 had done it so many times that we didn’t think that Mladić had fallen into the trap. I didn’t dare believe it. But when the news got out that the Serbian President, Boris Tadić, was going to hold an emergency press conference, it was clear that something big had happened. One, two hours of uncertainty. For many, probably the majority of Serbian citizens, anxiety filled moments for the arrest of “the greatest Serbian hero”. For me, traitor of nationalist Serbian interests, moments of hope. Because finally we accomplished the last act of the bloody tragedy that makes up the Balkan Wars, after which each side might be able to look into each other’s eyes. Before agreeing with me or before you begin to comment nervously, allow me to say a few more words. I don’t think that the International Criminal Tribunal of The Hague is the incarnation of world justice. I don’t think that Naser Orić and Ramush Haradinaj were acquitted from charges because they didn’t commit crimes. I don’t harbor illusions about the court’s impartiality. It’s clear that cards also get played based on political interests over there. For me Ratko Mladić’s arrest is not a matter concerning The Hague. I don’t care that it was one of the conditions to be met by Serbia in order to get closer to membership to the European Union. After all, for the Union we still have to wait much longer, there will be more Mladić, Hadžić and Kosovo and reforms of the judicial system, reforms for the fight against corruption and crime. I am interested in something else and I hope the same for the Country in which I live. I believe that after all that happened, without our collective will, we’ll be able to confront ourselves with our recent past. This is why I think it’s a good thing that Tadić, while addressing the journalists, said above all else that Mladić’s arrest is important for the reconciliation process in the region, for the families of the victims, for bringing to the surface the truth about the crimes. Of course Tadić said that this is a Serbian commitment, but he didn’t hide behind this statement. And whoever wrote his speech has my gratitude. I think that the President isn’t happy to be remembered in history because Karadžić and Mladić were extradited during his mandate. It doesn’t give him political points. Things like this don’t bring more votes but rather just anger from the people. I wouldn’t be able to discern that the Serbian president believes in reconciliation between the people of former Yugoslavia. I know for sure that he isn’t Willy Brandt. Tadić probably had to “carefully consider” the right moment for the arrest, because no one believed that Serbia didn’t know where General Mladić was. We could even speculate until the day of the verdict now. Was Mladić really at Lazarevo at his cousin’s home? Is it true that our police never searched that house? Has an “agreement” been made with Mladić who couldn’t go on hiding and escaping? I’ll leave it up to the experts and to the passive politicians (i.e. Tomislav Nikolić) to guess how, why, when, and where the arrest of Ratko Mladić took place. To me the event is now over. A weight is off my chest now. I know that this is a good thing for Serbia, that makes it simpler, that there is no longer reason to fuel the legend of an immortal general who loves his people so much to not give himself up alive to the anti-Serbian demons of The Hague. I can’t stand the various strategists that explain ad infinitum Mladić’s military genius and it’s only thanks to his courage and wisdom that the Republika Srpska and the Serbian people of Bosnia Herzegovina were saved. 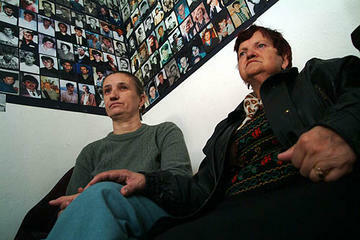 Mladić, they say now, didn’t know anything about Srebrenica. Just imagine! Him being the one who ordered the murder of thousands of people. The General is the best among the commanded soldiers of the army, those that fought without mercy against their occupiers in the First and Second World Wars. Excuse me? I have no understanding of any of this. Just like I don’t have it for the images of this great warrior who would never have given himself up alive but who carries with him a small plastic bag containing a cloth with his medicines in it because he doesn’t want to die. Or because he wanted to eat a few strawberries. He lived in poverty and couldn’t afford them. Or to guess if he had two or three strokes. If he only moves a part of his body. If he wants to go and visit the tomb of his daughter. It’s as if I were watching a soap opera and not broadcasts about a man who was wanted for serious crimes. Sorry, but I have no sympathy for Ratko Mladić, even if he were ill and suffering. Forgive me but you won’t be hearing any good words about him from me. May he defend himself in The Hague and may he demonstrate not being informed about Srebrenica. May he demonstrate his innocence. But don’t expect that I see Mladić as a victim, because the images of the mothers of Srebrenica keep coming up in my mind. A long time has gone by but not all can be forgotten. The issue for me is clear. He’s guilty because there’s never been an occasion in which he’s apologised, because the massacres do not interest him, because he didn’t go honourably to defend himself in court and say what happened. He’s guilty because for years we carry on ourselves a stain that cannot be wiped off. He’s guilty because for years he mocked us by hiding and watching our suffering from the sidelines. We are guilty too. We change slowly. Each one of us will carry the responsibility on his own shoulders. Mladić goes to The Hague. For Serbia this is excellent news. Period.